After our visit to the San Francisco Plantation, we were hungry and asked the lady in the gift shop if she had any recommendations of where to eat nearby. She suggested Buddy B’s for good food, although it’s nothing pretentious. If you have a right out of the plantation parking lot and drive a few blocks, you’ll find Buddy B’s on the right hand side of the road. The building is nothing special, but it’s a decent place to eat with a few options depending on how much time you have. One part of Buddy B’s is a basically a cafeteria-type set up where they have their daily lunch specials. These are obviously designed for the workingmen and women who come into eat and are short on time. They are priced very well and you have your lunch within minutes. Your other option is to order off of the menu and have something made to order. This is not the option you want if you’re short on time. Beverages are self-serve. 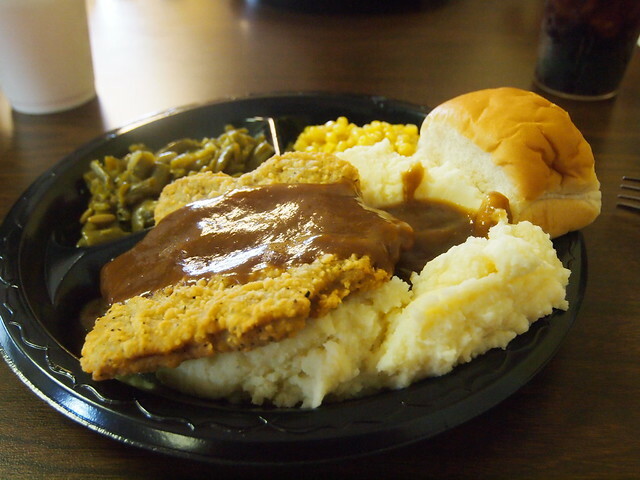 We went with two of the lunch specials, chicken fried steak and the red beans and rice. (We may be on some sort of personal mission to eat red beans and rice in every Louisiana restaurant we go to.) Both came with the same sides of green beans and corn. For a quick and cheap lunch, they were both pretty good. 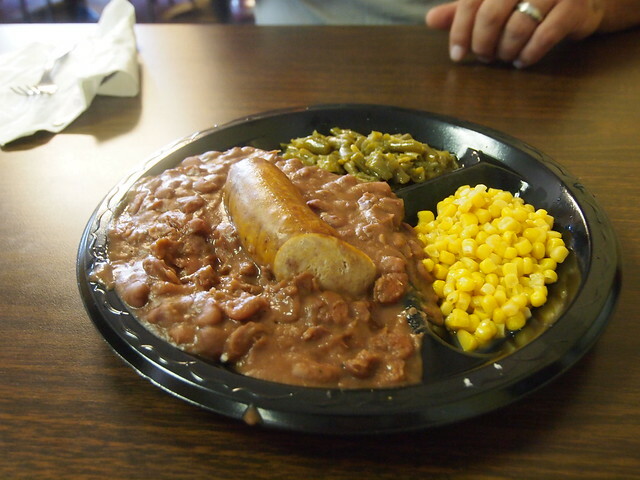 The red beans and rice was actually much better than the chicken fried steak, which was a bit greasy and I prefer white gravy than brown gravy on my chicken fry. For our son, we went with fried shrimp and had to order it off of the menu. Unfortunately, it took them quite a while to get it out and we were nearly done with our food by the time he got his, which really just meant that he shared with us until his food came out. However, the fried shrimp was very good and hot. The atmosphere is nice, but nothing pretentious as the gift shop lady said. It is clean and functional though and there’s plenty of seating available. I doubt that we’ll find ourselves back in the area of Buddy B’s again, but if we did, we might stop there for a quick lunch. If you’re touring the plantation houses and you want a quick meal so you can be back on your way, it’s a good option. The value for your money is definitely there as well.